The German Bundesliga was played over 7 weekends from October to April. Unfortunately last year my team, Remagen, got relegated and so I was obliged to find a new team. Luckily Solingen were happy to take me on board. Solingen is a city on the West side of Germany famous for its steel, a bit like Sheffield in England. The team’s made good use of its proximity to the Netherlands with three strong Dutch guys (Daniel Stellwagen, Jan Smeets and Erwin L’Ami) and Predrag Nikolic, who also lives in Holland. The team’s headed by top Austrian GM Markus Ragger. After winning all our matches in the first couple of weekends, relegation was never a fear this year and we tried to give Baden-Baden a run for the title. Last year I was unable to get a win, drawing 10 and losing 1 so this year it was a relief to win the first round. However things went a bit wrong for me in the February weekend straight after Gibraltar when I lost to the young German/ Danish talent Rasmus Svane. I think after this I put too much pressure on myself trying to bounce back and lost another couple of games but at least finished the season on +1 with 5.5/10, a much more bloodthirsty season than last time with +4 =3 -3! I was happy at least that my results complemented the team’s rather well (in general only losing when the team won comfortably anyway). The team had a fantastic start to the season, only dropping one draw in the first nine games but then had the toughest match of the season against heavy favourites Baden-Baden. Unfortunately this weekend clashed with the Reykjavik Open so I was unable to play as was Erwin L’Ami. We defended tenaciously but the team went down 5-3. In the end Baden-Baden managed a clean sweep of the opposition, winning all 15 games whilst we dropped off rather in the second half of the season, losing the clash for second against Mulheim but we managed to cling onto 3rd, apparently our usual spot! The final weekend was played in the very pleasant Schwetzingen Castle and after the final round I went for a walk around the fabulous grounds with Stephen Gordon, friend and fellow English GM. 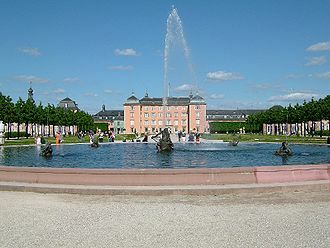 Schwetzingen Castle. Photo courtesy of Wikipedia. I hope that I’ll manage to perform better next season but at least I finished with a nice win in the last round. The German Bundesliga has a great website at http://schachbundesliga.de and http://bundesliga.liveschach.net/ has all the games with computer evaluations from the entire season.